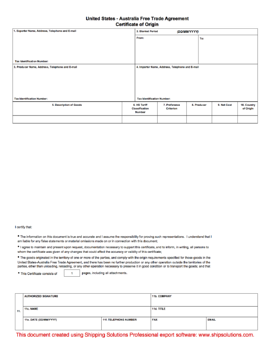 Find the certificate of origin export form you need to complete your shipment. Download a free, printable PDF version or generate a certificate electronically. A certificate of origin is a document that certifies the country where the goods originated. A certificate of origin may be required by the customs authority of the country where the goods are being imported. It’s also frequently used to determine how much duty the importer will pay to bring in the goods. There are two types of certificates of origin you may need to create: a Generic Certificate of Origin or a Free Trade Agreement Certificate of Origin. 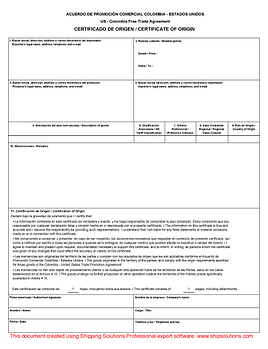 Most countries accept a generic certificate of origin form that includes information about the exporter and importer, the description and harmonized tariff code of the goods, and the country of origin. These certificates are usually prepared by the exporter and certified by the local chamber of commerce. The importer is heavily dependent upon the assistance and cooperation of its U.S. suppliers in producing accurate and well-documented declarations of origin. 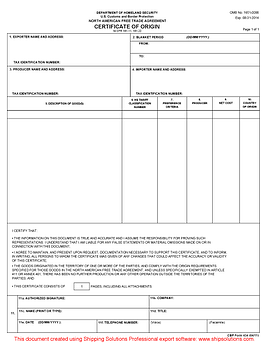 Previously, companies were required to download a certificate of origin form, manually enter the information, print the form, sign it, deliver it or courier it to a chamber of commerce office, wait to get it reviewed and signed by the appropriate chamber employee, return it or courier it back to the company office, and courier the signed and certified documents to the importer. Today, companies can enter their shipment information online, transmit it to a chamber, and get a certified certificate of origin in less than a day and at a fraction of the cost. Online certification saves on couriers, travel time, postage, and parking fees. Free trade agreements (FTA) between the United States and other countries utilize a certificate of origin to document that the goods listed on the form qualify for special tariff treatment under the terms of the free trade agreement. The North American Free Trade Agreement (NAFTA) allows substantial benefits for importers and exporters in Mexico, Canada, and the United States for goods originating in the three nations. These benefits of customs duty reduction and elimination depend upon an exporter's declaration of the origin of the goods, called the NAFTA Certificate of Origin. This certificate must be completed by the U.S. exporter, and must be in the possession of the Canadian or Mexican importer at the time the declaration is made to either Canadian Customs or Mexican Customs. The U.S. exporter is responsible for determining the eligibility of the goods for NAFTA treatment and for providing the importer with the certificate. 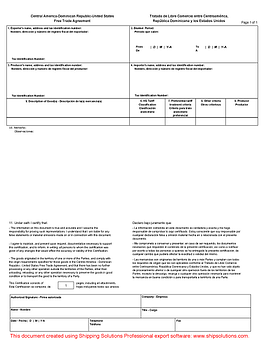 A NAFTA Certificate of Origin may be prepared for a single product of a one-time shipment, or for multiple shipments of identical items for a period of up to one year (Blanket Certificate). The exporter must determine the appropriate Rule of Origin for the merchandise. These eight rules are detailed in Chapter 4 of Annex 401 of the Free Trade Agreement, and cover items wholly obtained or produced in North America, having contents or components which have been sufficiently changed through production in North America, have sufficient Regional Value Content, or are listed in Annex 300 under certain Tariff Preference Levels (TPL). The Central America and Dominican Republic Free Trade Agreement (CAFTA-DR) designates the importer with the responsibility of claiming preferential tariff treatment under the Agreement. The importer should work with the U.S. exporter to ensure that a U.S. good meets the relevant rule of origin under the CAFTA-DR prior to making a claim. In general, a product's eligibility for preferential tariff treatment may be demonstrated in a variety of ways provided it is in written or electronic form, for instance: a statement on company letterhead, a statement on a commercial invoice, or a certification. While no official form is required in order to demonstrate eligibility for preferential tariff treatment under the CAFTA-DR, there is a required list of elements that need to be included. The U.S.-Chile Free Trade Agreement (FTA) provides lower duties on certain goods originating in and traded between the United States and Chile. The Chilean importer is responsible for claiming preferential treatment for a given shipment at the time the goods are cleared through Customs. (Under the U.S.-Chile FTA, the ultimate responsibility for the validity of the claim lies with the importer, not the exporter, as it is under NAFTA.) In order to claim the preferential duty rate, the importer must provide to Chilean Customs a written declaration, which may or may not be in the form of a certificate of origin. Despite the fact that the ultimate responsibility for making the declaration lies with the importer, the information needed to support the declaration will have to be provided by the producer. The written declaration that the goods are originating may be produced by the exporter, importer or producer of the goods. b. The issuer's intimate knowledge of the product, its manufacture, and its components. The United States-Colombia Free Trade Agreement (FTA) entered into force on May 15, 2012. On the day of implementation, more than 80% of U.S. industrial goods exports to Colombia became duty-free including agricultural and construction equipment, building products, aircraft and parts, fertilizers, information technology equipment, medical and scientific equipment, and wood. It is the responsibility of the importer in Colombia to make a claim for the FTA-negotiated preferential tariff rate for qualifying products. However, the exporter or producer may be asked by the importer, customs broker, or the Colombia Customs Service to provide a written or electronic certification or other information to support the importer’s claim. 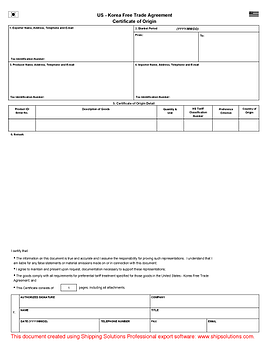 While there is no required form for certifying origin, this is form that is commonly used by many exporters and importers. The U.S.-Australia Free Trade Agreement (FTA) is an agreement between the United States and Australia that allows both nations to establish free trade between the two nations through the reduction and elimination of barriers to trade in goods and services. In order to qualify, a product must qualify as "originating" under the terms of the Agreement. This means that the product must have sufficient U.S. or Australian content or processing to meet the criteria of the Agreement. If goods contain only U.S. or Australian inputs, they qualify. If they contain some inputs from other countries, they still might qualify if they meet specific criteria set out in the Rules of Origin of the Agreement. The U.S.-Australia FTA calls for the importer to make a claim of preference. The importer may therefore ask the exporter for this information. The exporter (seller) may give confirmation, in an un-prescribed format, of why the goods qualify as "originating," which the importer may use to validate its claim. It is advisable to work with your importer and provide your importer with a written statement of origin upon request. Customs officials can require importers to maintain documents relating to purchases and costs for up to five years after importation, should investigation and verification of claims be required. Customs officials can also seek information from exporters in verifying claims. 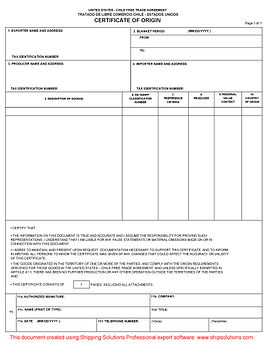 Prior to April 1, 2018, U.S. exporters who wished to qualify for preferential access to the Israeli market needed to use a special green certificate of origin form. That form has now been replaced by a U.S. 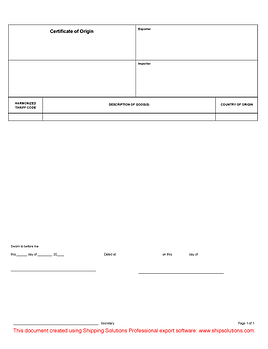 Origin Invoice Declaration that needs to appear on a commercial document, which would typically be the commercial invoice. On March 15, 2012, the U.S.-Korea Free Trade Agreement (sometimes referred to as KORUS) was implemented in both countries. The KORUS provisions are in General Note 33 of the Harmonized Tariff. A good must be shipped directly from one country to the other. Any stops in a location other than the U.S. or Korea for anything other than unloading, reloading, or other processes needed to preserve the condition of the good will disqualify the shipment from KORUS benefits. As with all the other FTAs to which the U.S. is a signatory, KORUS-eligible goods are exempt from the merchandise processing fee. Each shipment must also be accompanied by a certificate of origin.